WILMINGTON — Argus, the tall ship that carried thousands of Boy Scouts of America on the Pacific Ocean, now lies at the bottom of the harbor. But Wayne Ettel and The Argus Foundation plan to return the vessel to its former glory. Ettel, who has kept the deteriorating vessel afloat at his company’s dock — Boatswayne Ettel’s — for the last seven years, woke up on the morning of Dec. 3, 2013 and knew something wasn’t right. When he got up to open his shop door, Ettel noticed that Argus was sitting lower in the water than it usually did. As he went aboard the tall ship, he saw salt water already flooded over the pumps of the vessel. “I called the fire department and started getting hatch boards off so they could get their pumps in,” Ettel said. It is unknown what caused the ship to sink, he said, but the former Sea Scout and crew member has every intention of saving Argus from sitting on the bottom of the ocean. Built in Marstal, Denmark in 1908, Argus worked as a cargo ship in Baltic and Scandinavian waters for Capt. Lars Anker Nielsen for 22 years before being sold to Tucker Thompson. After sailing around the world, Thompson brought the boat to Mexico, where he and his family made their way north through Baja, Calif., San Diego and finally to Newport Beach, Calif. where they docked at the Newport Sea Base in 1970. Ralph Whitford, a Newport Harbor High School teacher and head of the Newport Sea Base at the time, thought the tall ship would make a great learning platform for Sea Scouts. He convinced Thompson to part with his boat for $40,000, said Fred Bockmiller, Argus’ longest standing captain. Bockmiller, who has captained Argus for 26 years, recalled the times he spent sailing the vessel on the South Pacific Ocean where he was responsible for teaching 20 teenage boys how to navigate the tall ship. He had his own share of adventures on the vessel. Braving terrible weather for hours at a time at an open air helm, witnessing a pod of six blue whales diving beneath the ship and saving a man’s life are some experiences etched in his memory. The body turned out to be Dan Carlock, a diver who had been abandoned by his ship. Although he was alive, he had already reached hypothermia,Bockmiller recalled. His crew brought him aboard Argus and sailed back to Newport Harbor. Eventually, the 106-year-old tall ship began to show its age. “The Sea Scout Base was making a lot of money from the ship but they weren’t putting enough back into it,” said Ettel, whose company was responsible for replacing Argus’ deck and sanitation systems in 1992. Upon the vessel’s retirement, Whitford bought it for $1 with plans to have it repaired. Ettel, an original Sea Scout who sailed aboard Argus, offered to keep the vessel afloat at his dock while Whitford raised money through The Argus Foundation to repair it. Once enough funds were raised, Ettel, a shipwright by trade, would restore the boat. But funding never came, and last December, Whitford passed away, leaving Argus unclaimed and perpetually floating at Ettel’s dock. Now Ettel and other former Sea Scouts of Argus like Devin Dwyer, are working to raise $120,000 to lift the boat from the water, haul her out and buy the lumber and other materials needed to restore the vessel back to her former glory. It’s either that, or sign her over to the port, which will raise her and send her to the disposal dock, Ettel said. And after all of the boat’s history, it’s the last thing he wants to do. Anyone interested in donating can address checks to The Argus Foundation and send to 310 22nd street, Huntington Beach, Calif. 92648. My fiancé and I (now married for 34 years) were passengers on the Argus in 1981 for the Christmas Parade in Newport Harbor. She was an awesome vessel then a and every year brings back memories of the time on that ship. what is the status of Argus today? I cooked for boys and crew twice on trips. Quite an experience! I remember cutting down lasagna pans to fit in the tiny oven of the galley. Is there still an effort to restore her? Has she been restored? I sailed on this boat in the 90s. A friend and I flipped a coin to decide which of us would sleep on the floor. Another crew of Sea Scouts who were older than us told us to do push ups and bullied us. The food we ate was subpar. These older kids bought and listened to mainstream Pearl Jam, heard “Don’t Call me Daughter” repeatedly. We didn’t shower for a week. I don’t think we went to Catalina, just a cruise at Sea. Got to know that ship pretty well, can still see the twin beds of the sleeping quarters and the head along the forward last in my minds eye. It wasn’t very clean. Could have used interior update work even back then. Glad to have had the experience, could have had better company. I’m sure for the first 30 or 40 years of the Argus, it was a wonderful vessel. I was 13 years old in 1980 when I had the privilege of sailing on the Argus. Besides getting married and becoming a father the Argus is one of the most significant memories of my life. 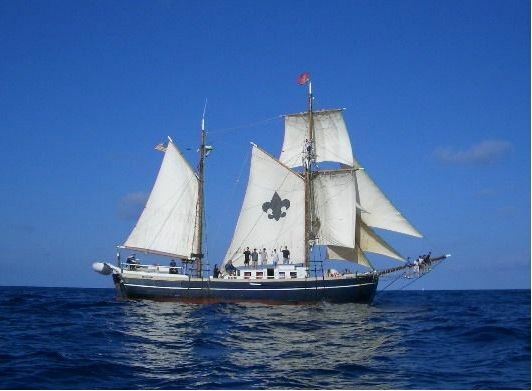 The Boy Scouts of America had loaned the 13 sail GAF rigged Ketch with a topsail to a program named Vision Quest, a program ran by Bob Burton to help troubled youth find a positive direction in life. I will never forget sailing San Francisco Bay and dropping anchor at the intercoast by Alcatraz and swinging off the starboard side halyards into the strong currents of the bay and swimming back to the tall ship and climbing back up the cargo nets and doing it again and again. Such an amazing memory and experience of my life. I was so willing to learn everything I could on my short stay on the Argus that my program directors Mary H.. and Jack W… And my crew and deckhands officially named me, Captain for a day…I remember a reporter from the San Francisco Times I believe was the newspaper came to interview me and my experience on this amazing and wonderful ship…I was and still am extremely proud and honored to be part of her crew.. If I can ever be part of her again, I wouldn’t hesitate my decision.